Re-appear Panel for semester courses (other than IT/Mgmt courses) has been started in July 13 session , last date is 18 July 2014. Last date to fill Re-appear paper is 27/06/2014. EXTERNAL / PRACTICAL ASSESSMENT REPORT OPTION NOW AVAILABLE ON PANEL. Internal & External (Practical) On-Line awards panel has been started of B.A. / B.Com Exam Apr-2014 for all ISC/Colleges of DDE. Last date is 10 May 2014. Kindly deposit the Internal Assessment Report at Result Branch & External (Practical) Assessment Report at Conduct Branch by 15 May 2014.It is compulsory for all. The exams of fresh students enrolled in 2013-14 for M.A./M.Sc./M.Com/B.Lib.I. Sc./M.Lib. I.Sc. 1st year are likely to commence from 20th May 2014 onwards. 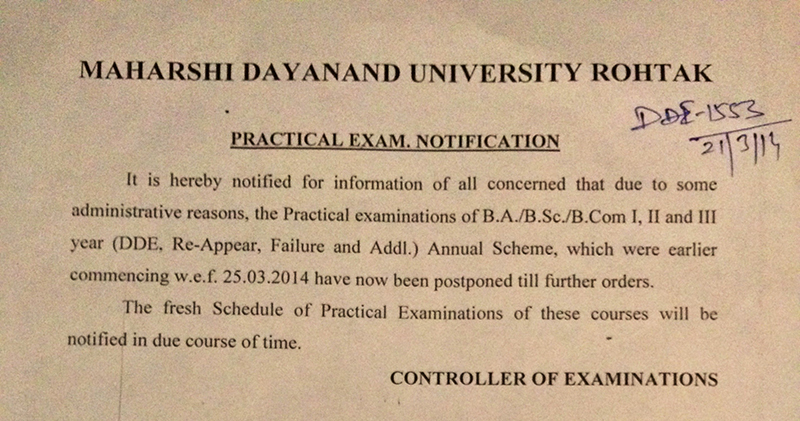 Download Practical Examination Admit Card for UG Annual (FULL) DDE COURSES from 18th April 2014 after 9:00 P.M. 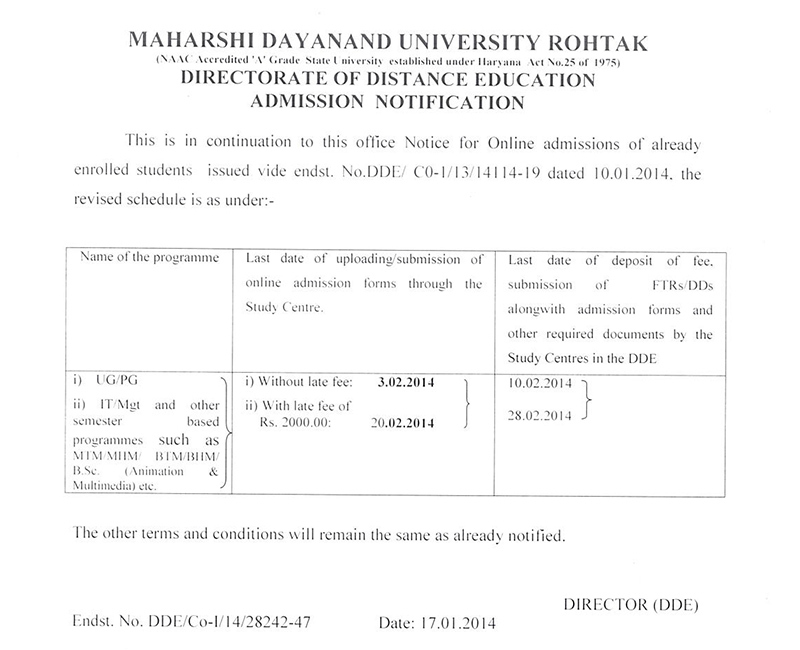 Admission Notification for DDE for already enrolled students of IT/Mgt. and other semester based programes such as MTM/MHM/BTM/BHM/B.Sc(Animation & Multimedia) etc. 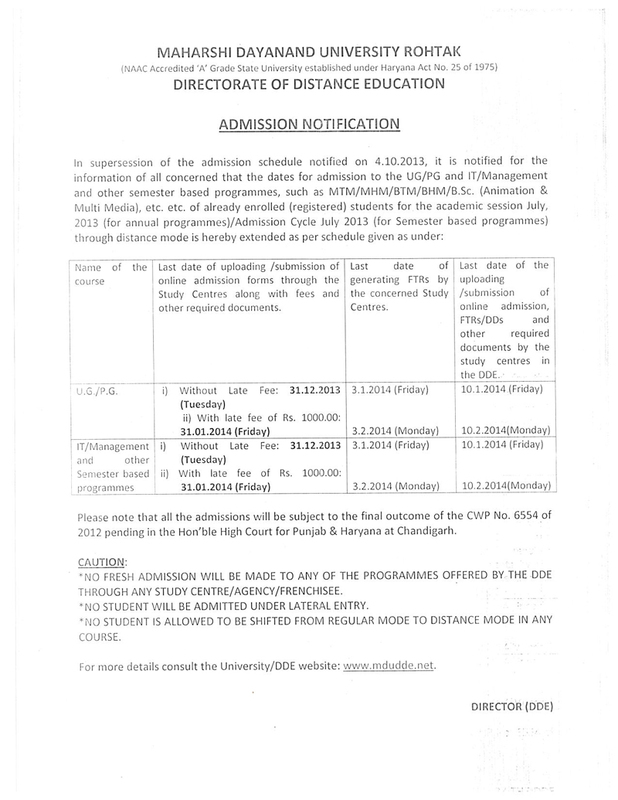 List of Not Eligible students of Bachelor of Arts (DDE)(First Year) Session 2013-2014. 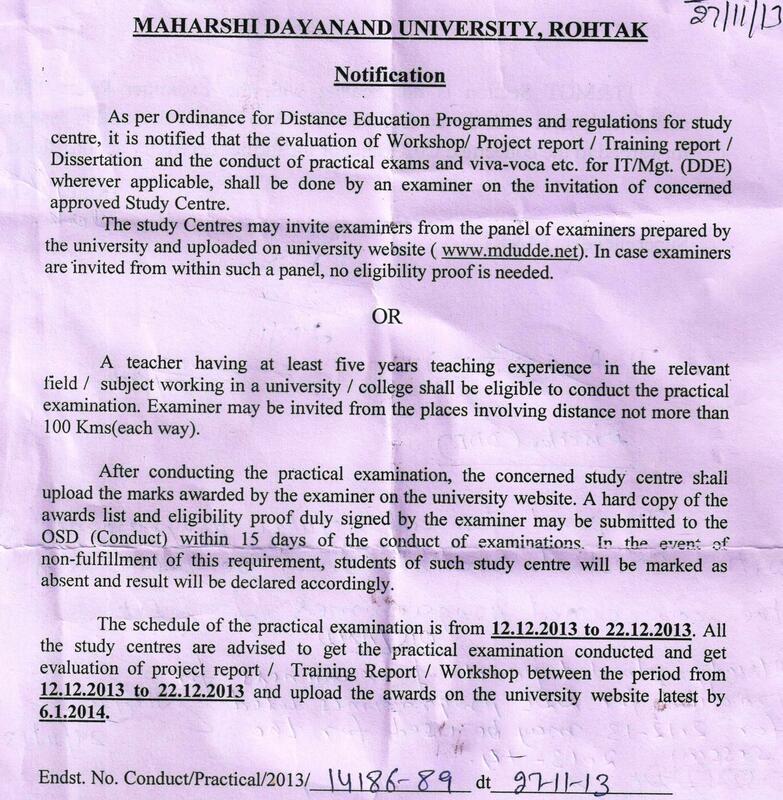 List of Not Eligible students of Bachelor of Commerce (DDE)(First Year) Session 2013-2014. 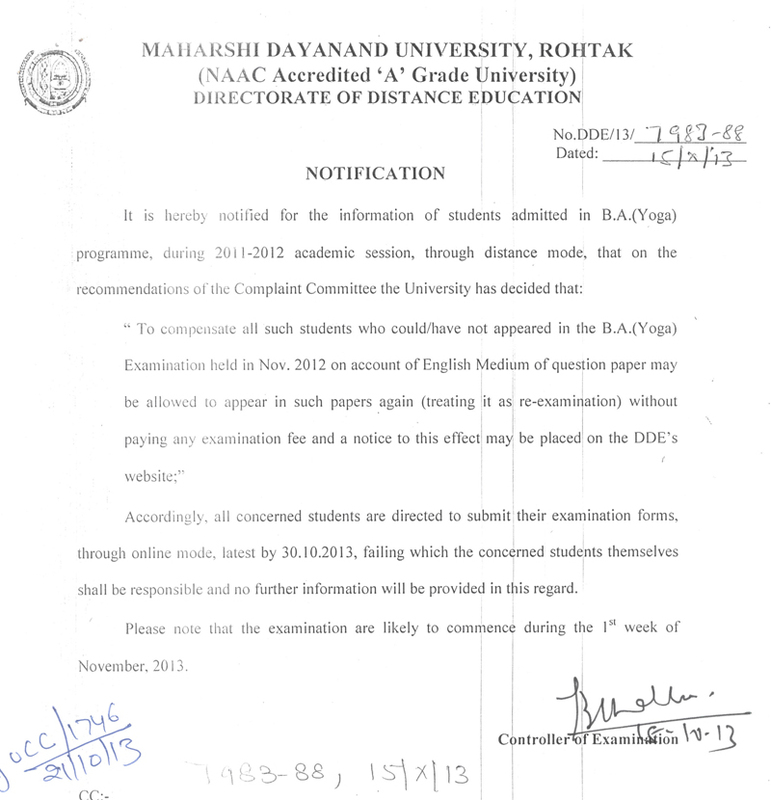 List of Not Eligible newly admitted 1st year students of M.A.,M.Com.,M.Sc.(Math),BBA,BCA,B.L.I.Sc. and M.L.I.Sc. programmes for the session 2013-2014. RE-APPEAR PANEL FOR . B.A. (FINE ARTS ) - 1ST, 2ND, 3RD YEAR MJMC - 1ST, 2ND YEAR,P.G. DIPLOMA IN PUBLIC RELATION AND MEDIA MANAGEMENT, P.G. DIPLOMA IN CORPORATE AND INDUSTRIAL SECURITY MANAGEMENT AND B.A (YOGA) - 1ST, 2ND, 3RD YEAR HAS BEEN STARTED IN JUL-2012 PANEL LAST DATE IS 15 FEB 2014. Special Chance to the students who were registered in academic session 2004. Notification regarding the Student Support Service Camps & Study Material for newly admitted students for the session 2013-2014. ADMIT CARDS FOR JULY-2013 IT/MGMT(Jan2013) EXAMS AND UG/PG – OUT OF JURISDICTION (Jul-2012) ARE UPLOADED ON FTR & DIARY , PLS DOWNLOAD. LETTER FOR ADMISSION FORMS OF JUL11 AND JAN12 SESSION. 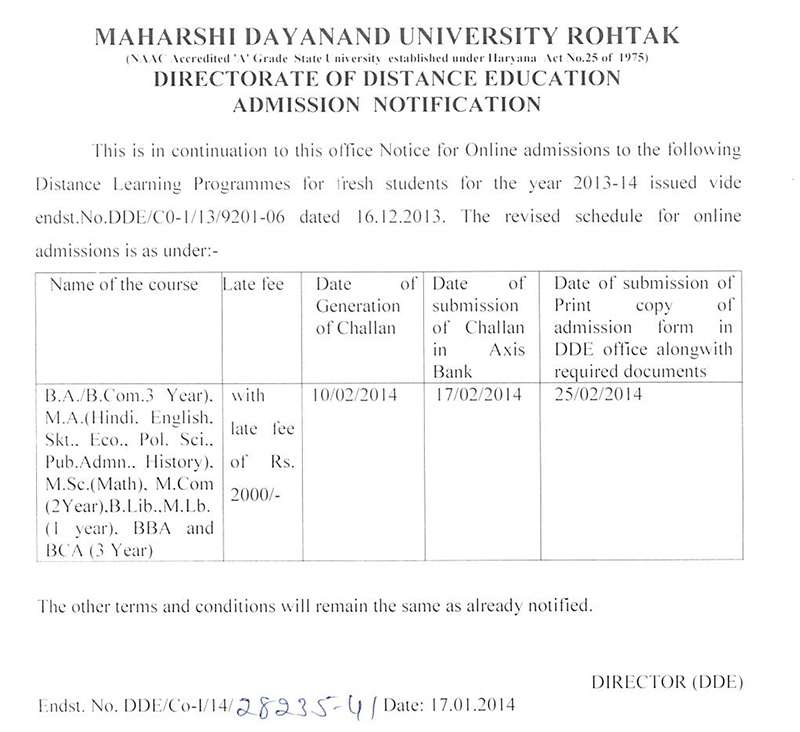 Revised Admission Notice: last Date for DDE online Admissions is hereby extended. 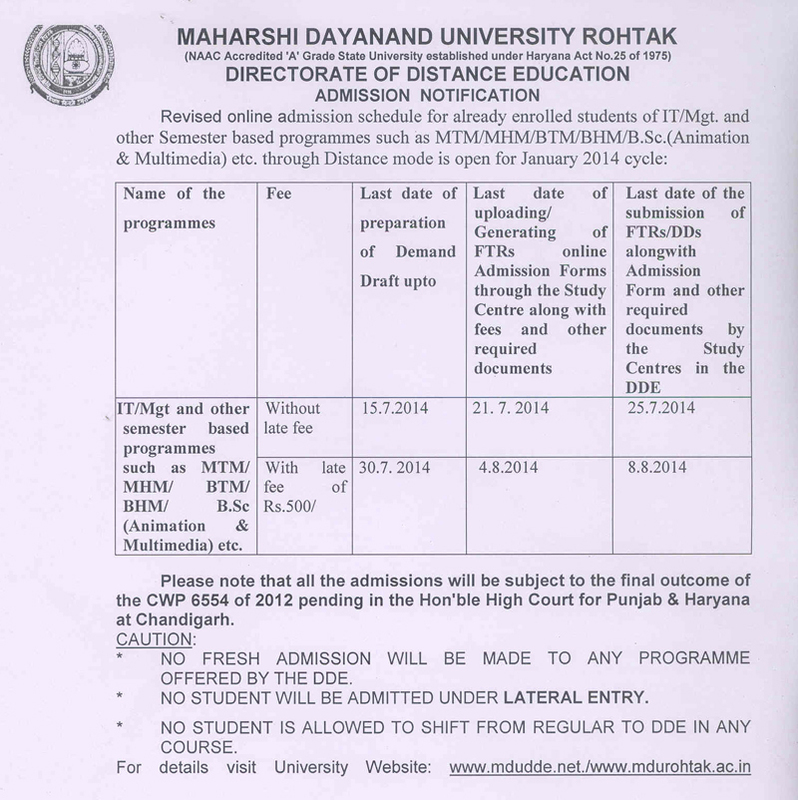 Admission Notification for Distance Programmes for 2015-16 - for both Fresh Students as well as Re-registration students"
Admission Notice for BBA/BCA 4th Semester through Distance Education mode. 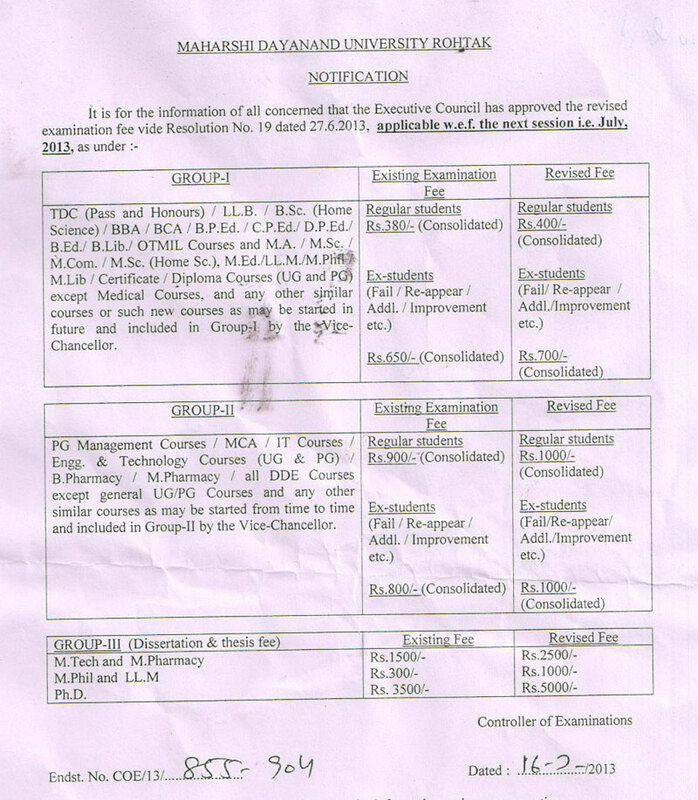 Notice for Counselling Sessions for M.A./M.Sc(Math)/M.Com(Prev & Final) & B.Lib/M.Lib for 2014-15. 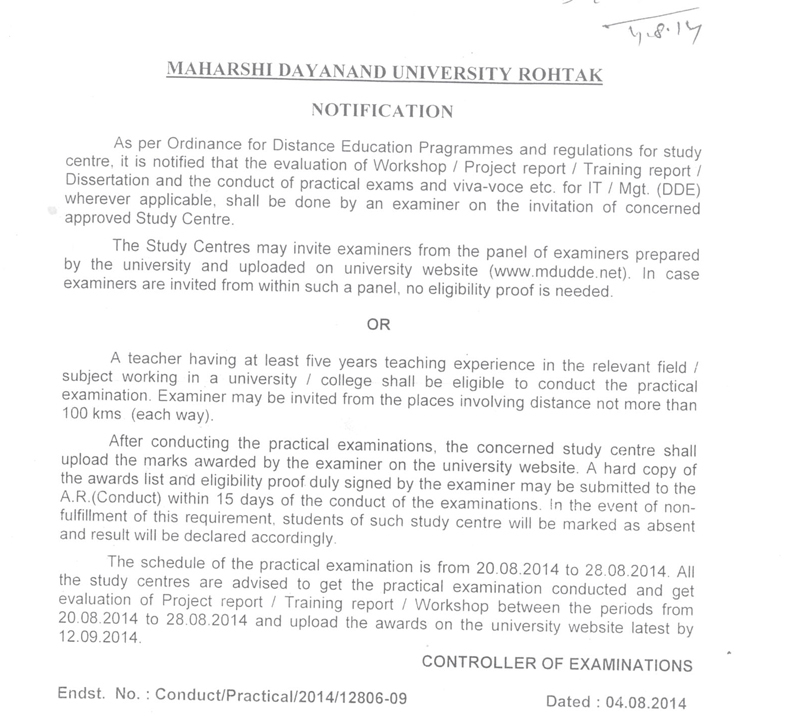 List of students provisionally admitted to B.Com Part-I in session 2014-15 and Venue of Counselling. List of students provisionally admitted to B.A. 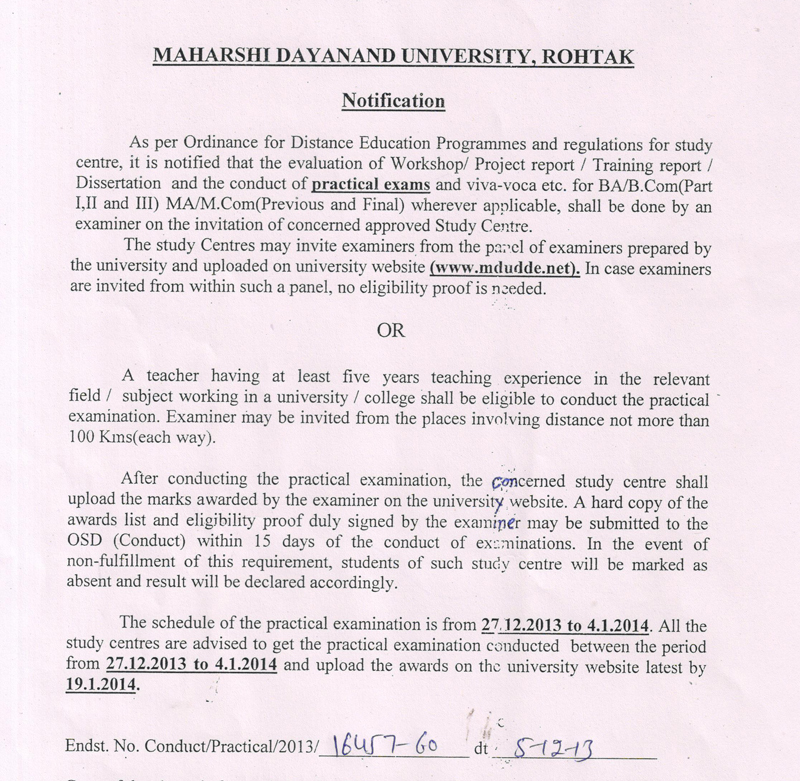 Part-II in session 2014-15 and Venue of Counselling. List of students provisionally admitted to B.A. 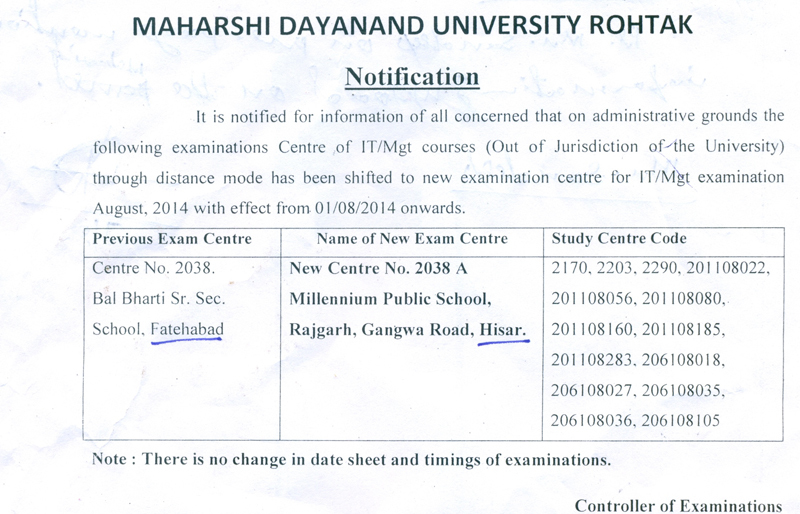 Part-I in session 2014-15 and Venue of Counselling. 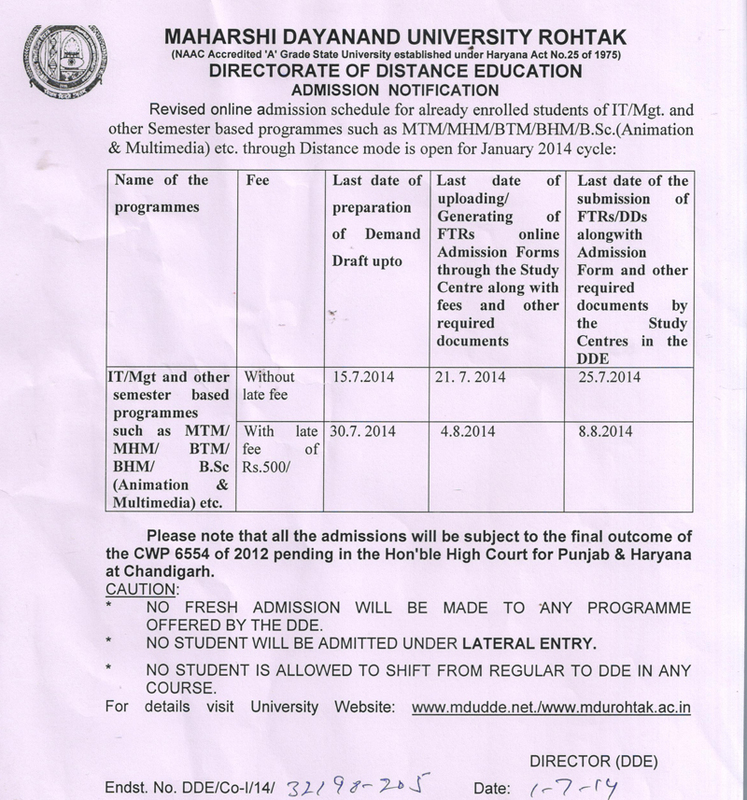 Admit Card For BTM, BHM, MBA(FM),MHM, BA(FINE ARTS), B.SC(ID) are now available in Jul2013 Panel. Admit Cards for UG/PG (Out Of Jurisdiction) are now available in Jul 2013 session panel.